Not as widely used as some of the other open “power chord” 1-5-1 tunings, the A E A tuning is still a good one to try out and have in your toolbag. A full step higher than the more widely-seen Open G tuning, the high A note can be a bit too trebly for some people, but the lower tuning with the unwound .016″ as the middle A puts out a really nice sound. First, a disclaimer: these recommendations are made based on our experimentation in the C. B. Gitty shops, and it is what we have found to work. Other people may have different opinions, and they are welcome to them. I’m not trying to set any standards or lay down any laws – I am just going to tell you what works for us. Check out the various string sets available over at www.CBGitty.com! Each one of these will have a different overall sound and feel – all four use a mix of wound and unwound strings, and range from the bassiest (#1 up to the highest-pitched (#4). Deciding which option is right for you is mostly a matter of preference, and experimentation. All four can be used to play tablature and lessons intended for guitars tuned to GDG – it will just be one step higher when played. You have to decide whether you want the low growly bass of the low strings, the treble of the high strings, or a mix). If I had to arbitrarily make a recommendation of which one you should use, I would probably go with #1B: Low A, Middle E, Middle A (unwound). I just don’t personally like that high A note, it sounds too shrill. 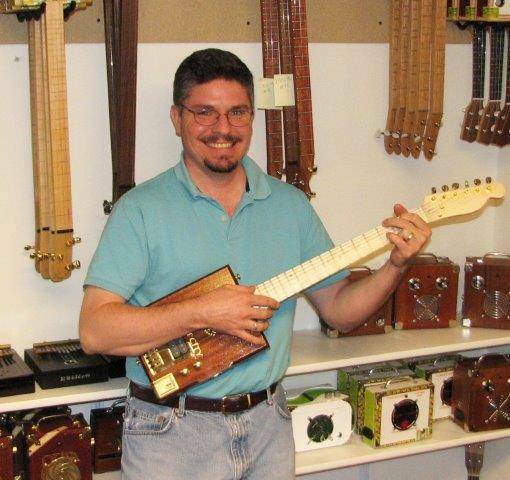 That may be partly due to the cigar box guitar I was using to test these tunings – different CBGs resonate better at different frequencies. But I really liked how that lower tuning sounded with that unwound string on top. Listen to the clips below and see what you think! Low A – use the low A string (second biggest wound string). Middle E – Tune the wound D string on a standard guitar – third biggest wound string – up a full step. Middle A – Tune the middle G string on a standard guitar up a full step, or use the unwound B string down a full step. High E – This is the same as the high E string (smallest unwound string) on a standard guitar. High A – Unfortunately there is no equivalent string in a standard 6-string guitar pack that will reach this note.. If you want to know recommended string gauges for buying in bulk, then the chart below should help you pick out the specific gauges you’ll need. Remember that moving to a larger string gauge means you’ll have to crank it tighter to reach the same pitch, compared to a smaller gauge. Also remember that the chart below is specifically for “standard” scale instruments, that fall an inch or so on either side of a 25″ scale length. We give both “heavy”, “medium” and “light” recommendations below, so you can pick a set best suited to your instrument. Heavier strings will have to be cranked tighter than light string sets to reach the right pitch, and this will put more tension on your guitar, bowing your neck more, etc. I recommend starting with the lighter gauge strings and experimenting from there. 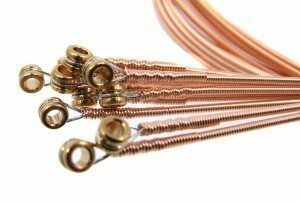 These sizes should work with both acoustic and electric guitar strings. Generally electric guitars are strung on the lighter gauge size. The gauges below are hyperlinked to the bulk strings listings at CBGitty.com, where available. *If you can get a .022″ string to hit middle A at 25″ scale length, more power to you! Ours broke almost every time when we tried. ** Getting a .009″ up to high A at 25″ scale length is definitely pushing it… I recommend sticking with .008″ for high A. So from all of this, we can get some recommended string sizes to achieve the 4 tunings mentioned above. For this example I’ll list the “Light Gauge” sizes, but you should be able to easily pick out the medium or heavy gauge sizes if you want. The Wiggle Room Factor: you can generally get by with a little larger or little smaller string for any given pitch. Each string has its ideal tension zone, but the edges of that zone are a bit gray. 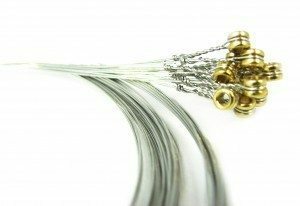 If you keep breaking a string trying to hit a particular pitch, try a smaller gauge string! 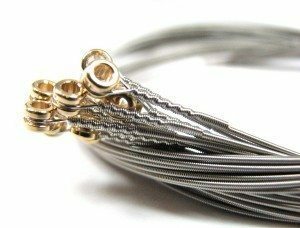 If a string seems too loose and flappy, move to a larger gauge string. 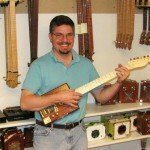 Be sure to check out our other articles on cigar box guitar tunings for more great info, sound clips and how-to! I use this tuning all the time, great info on string gauges thanks. I just turned 71 Nov. 25 and my fingers don’t allow me to play 6 string. I have been making 3 string CBG for a few years with the help of CBGitty’s store and information. Have just built my first 1 string Canjoe’s and am fascinated at to what I can do with them. I find it easer to write songs with the canjoe because of its simplicity. Also the cord forms for 3 string have opened up another door into that instrument. Thanks for these articles. Yes that’s right, good catch! We’ve updated the article to fix the mistake. On the string gauge chart Middle E medium gauge should be .28 not .38 right? Will you do the same for 4 string also?